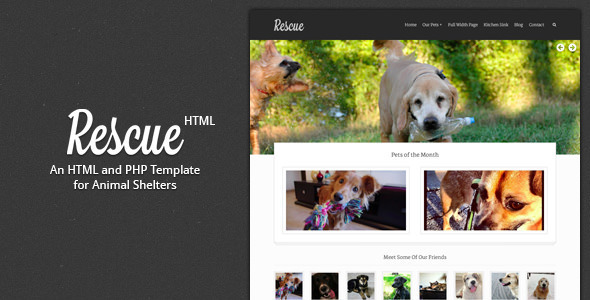 Rescue – Animal Shelter HTML Template Created by designcrumbs. This templates have specific characteristics, namely: Rescue is a template built with one purpose: Getting animals adopted. And on the plus side, your shelter can now have an awesome looking website. .
You can use this Rescue – Animal Shelter HTML Template on Site templates category for animal shelter, animals, cats, charity, clean, css3, dogs, html5, modern, non-profit, pets, shelter and another uses. Responsive & Retina Display Ready – Try the demo on your iPad! Sticky header option for desktop layout – Keep your menu on top! jQuery slider on the home page, plus jQuery hovers and lightboxes for images. Support is provided at http://designcrumbs.ticksy.com.